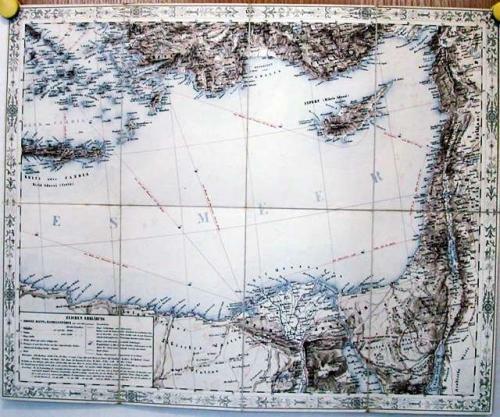 Sheet XXIV of Scheda's Generale Karte von Europe depicting the eastern Mediterranean region including Crete, Cyprus, Palestine and northern Egypt. The pilgrimage routes from Cairo to Mecca (across the Sinia desert) and from Damascus to Mecca are shown. This topographical map also shows the major roads, railways and sea routes (with the distance between ports shown in nautical miles). The map has been dissected into 8 sections and laid on linen. A finely executed strap work border surrounds the map. Scarce.